We’ve just posted the annual update to our spreadsheet model — our powerful but easy-to-use tool for predicting future emissions and revenues from possible U.S. carbon taxes. The model, which runs in Excel, accepts any carbon tax trajectory you feed it and spits out estimated economy-wide emission reductions and revenue generation, year by year. Stiffer tax means steeper reductions. Our model quantifies the relationship. 1. A year of new data: The most obvious update is our incorporating 2015 baseline data on energy use, CO2 emissions and emission intensity for each of the model’s eight sectors. 2. Oil refining made explicit: We’ve added an eighth sector: oil refining. 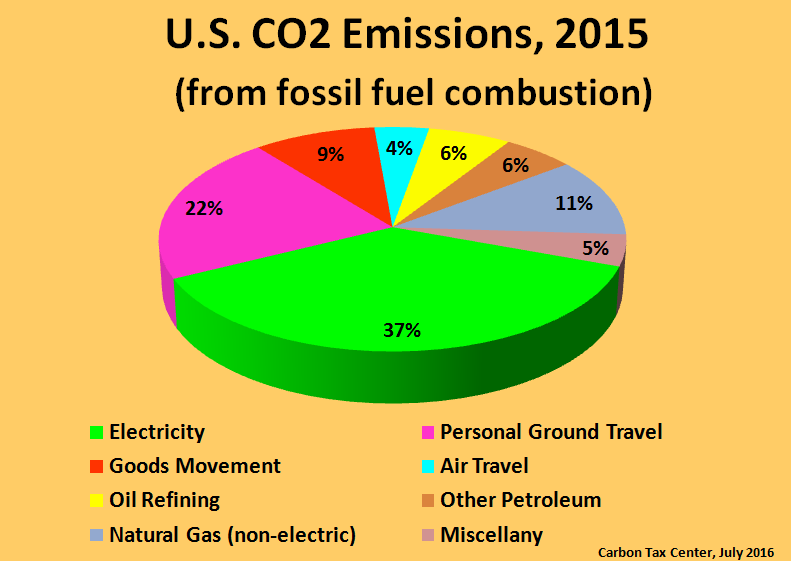 Until now, refinery emissions were lumped with “Other Petroleum Products,” which was too broad-brush, especially considering that they accounted for an estimated 6.4% of U.S. CO2 emissions last year. Refinery fuel use now has its own sector. This not only trims the catch-all “Other” category, allowing greater precision; it also ensures that future changes in use of gasoline, diesel, jet fuel and other petroleum products are carried through the supply chain to yield emission changes in the refining process, not just at the exhaust pipe. 3. 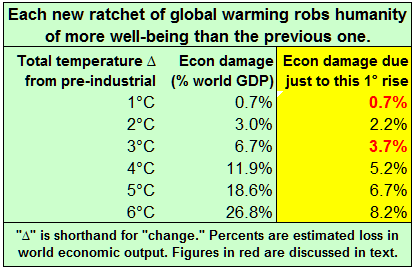 Sharper graphics: The graphics in this post are among the dozen with which the spreadsheet conveys the rapid reductions from robust carbon taxes, especially vis-a-vis well-meaning but limited policies such as the Obama Administration’s Clean Power Plan. Our updated model has lots of graphics. 4. Emissions consequences of cheap oil: While the model is baselined to official U.S. forecast energy prices (from the Energy Information Administration’s “Annual Energy Outlook”), the current version is the first in which the 2015-2016 oil price slump reverberates for many years. The lower baseline price projections for gasoline and other petroleum fuels don’t change the predicted impact of carbon taxes on demand for those fuels, but they do establish a higher usage trajectory than in previous years, underscoring the need for a robust carbon tax. 1. Smoothing the carbon tax impact: The model can reflect lags in households’ and businesses’ adaptation to more-expensive fossil fuels. 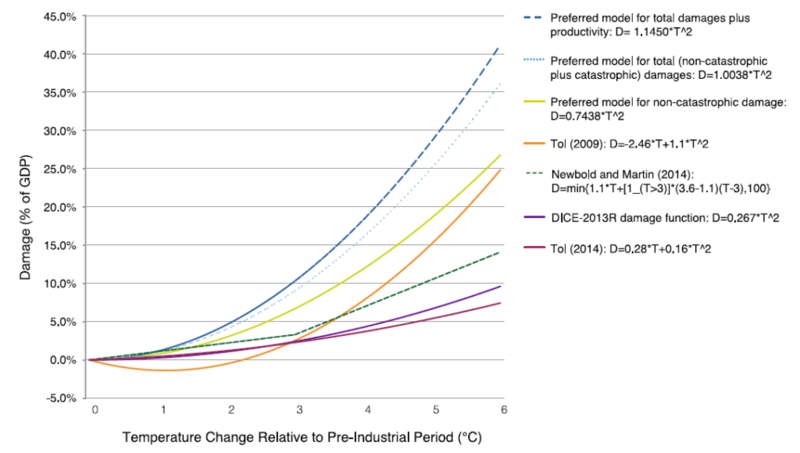 The user sets the adaptation “ceiling” rate; the model automatically carries over any excess to future years.) This feature is helpful for trajectories like the Whitehouse-Schatz bill, which kicks off with a bang at $45 per ton of carbon dioxide but then rises only slowly. Under our default setting, in which the economy is assumed to react in any year only to tax increments up to $12.50 per metric ton of CO2 ($11.34 per short ton), the reductions from that initial $45/ton charge are spread over four years rather than, unrealistically, assigned to the first year. 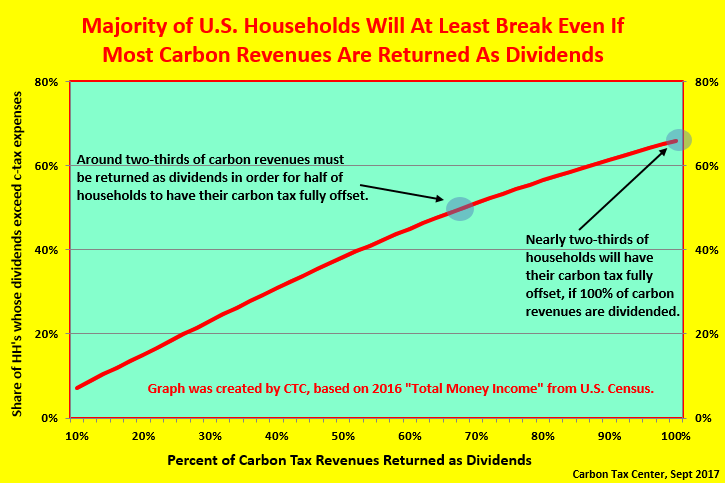 Results are for tax that rises annually at $12.50 per metric ton of CO2. 2. Demand impacts vs. Supply side impacts: At the bottom of the Summary page is a new section comparing the projected CO2 reductions from changes in fuels’ carbon intensities (“supply side”) versus reductions from reduced energy usage (“demand side,” e.g., lower electricity purchases, less driving or flying). 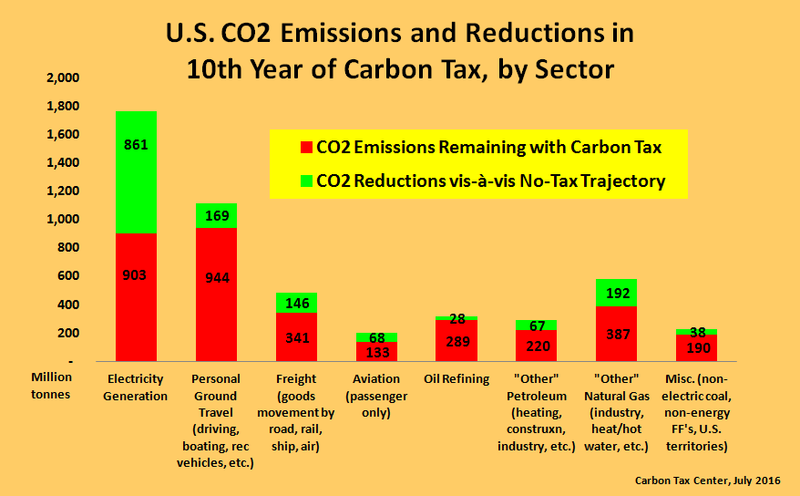 Under our default carbon tax — the one proposed by Washington Rep. Jim McDermott — an estimated 58% of projected CO2 reductions are on the supply side (i.e., due to decarbonization); a large minority, 42%, come about through reduced demand, illustrating that subsidies-only policies miss out on huge CO2 reductions. Indeed, they undercut reductions from decarbonization by stimulating energy usage through lowered energy prices, as we pointed out in our 2014 comments to the Senate Finance Committee. Please download the spreadsheet — here’s the link again — and run it in Excel. 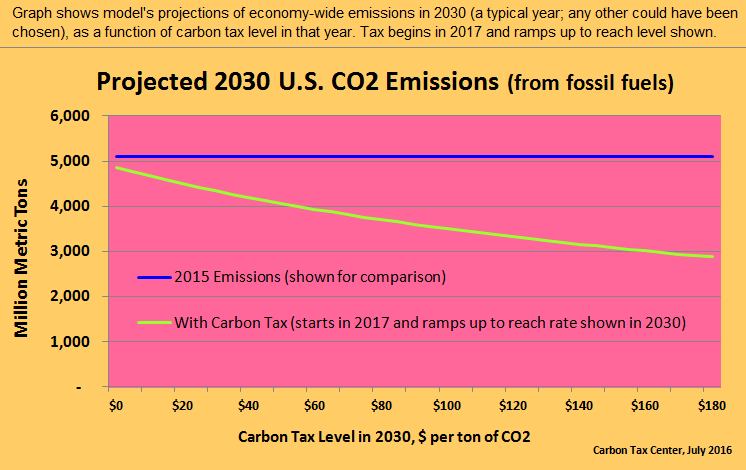 See for yourself the relative efficacy of a carbon tax trajectory that increases by a fixed amount each year, as does the McDermott tax, vs. one like Whitehouse-Schatz that starts high but rises only by small, percentage-driven amounts. See also how much more quickly emissions decline under either carbon tax scenario, compared to the Clean Power Plan and other regulatory policies forced on the Obama Administration by the recalcitrant Republican-controlled Congress. As you work (play?) with the model, jot down your thoughts so you can tell us what works and what needs improving. Thank you. 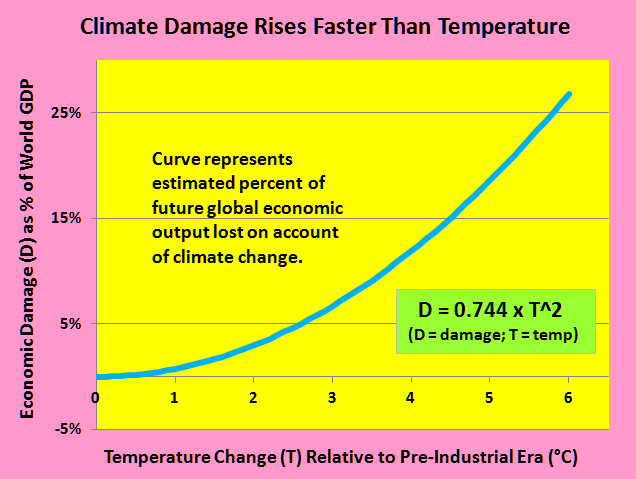 Note: graphic at top has replaced similar graph that (confusingly) expressed carbon tax in terms of annual increments.